The international symposium on partial differential equations in the Silk Road Center is jointly sponsored by Hua Loo-Keng Center for Mathematical Science and Chinese Mathematics Society, it is part of the activities of the Academic Year of PDE in 2017. The symposium was held in South Building 204 (Institute of mathematics and systems science, Chinese Academy of Sciences) from April 10th, 2017 to April 21st. 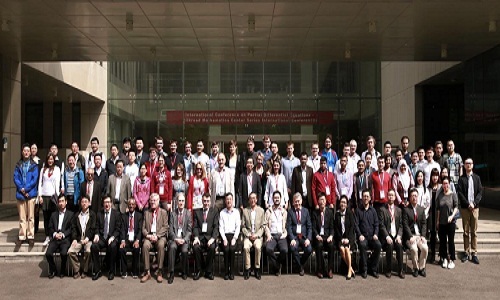 Nearly 90 scholars from China, Russia, France, Turkey, Poland, Singapore, Canada, Australia, Philippines, Nepal, Japan, South Korea and Hongkong in more than 10 countries and regions participated in the symposium. In the first week, short course lectures were given by 4 famous scholars: professor Varga KALANTAROV from Koc University in Turkey, professor Sergei KUKSIN from Université Paris Diderot, professor Sergey TIKHOMIRNOV University of St Petersburg and Zhouping XIN from Chinese University Hong Kong, a total of 21 conference reports and 30 poster speeches were arranged at the second week of the symposium. There are many world famous experts on partial differential equations in the conference, such as professor Lin Fanghua from New York University, professor Wei Juncheng from British Columbia university in Canada, professor Xin Zhouping from Chinese University Hong Kong, professor Yang Tong, director of Hongkong Mathematical Society from City University Hong Kong, , professor Yan Shusen from University of New England in Australia, professor Chen Guiqiang from University of Oxford in UK, professor Zhang Zhifei from Peking University, professor Peter MARKOWICH from University of Cambridge in UK, professor Dongho CHAE from Chung-Ang University of Korea and professor HA Seung-Yeal from Seoul National University, professor Kawashima from Kyushu University in Japan, professor Andrei FURSIKOV and Alexei DAVYDOV from Moscow State University, professor Agnieszka SWIERCZEWS-GWIAZDA and professor Jaroslaw MEDERSKI from Poland University.